Human Resource (HR) compliance is a term to describe that HR processes are in place and federal, state and local labor laws are adhered to. An HR audit can help you identify compliance issues and avoid costly legal blunders. Our free HR audit can help you verify your business’ HR compliance in five easy steps. Many small business owners find HR compliance to be both confusing and time-consuming. To avoid the risk of labor law violations, especially as your business scales or expands into multiple work states, consider working with a professional employer organization (PEO) like ADP Total Source. ADP Total Source can ensure your business is HR compliant. An HR audit is a process your business can use to ensure HR compliance. A new business may want to complete an HR audit in preparation for their first hire. An established business should conduct an HR audit annually to prevent labor law violations. Use our HR audit checklist to complete your audit free. You can download our free HR audit checklist to verify that your business is compliant with HR labor law at the federal level. You will want to review your state and local workforce laws to ensure that there aren’t local regulations that you need to adhere to as well. Our template provides best practices, but may not cover every instance where a regulation governs your employees. Therefore, we suggest reviewing state workforce laws in all locations where your business operates. Download HR Audit Checklist as PDF or DOC file. HR compliance covers a broad range of topics and labor laws. Examples of federal labor laws to be compliant with are Occupational Safety and Health Act (OSHA), Equal Employment Opportunity Commission (EEOC), Fair Labor Standards Act (FLSA), and the Affordable Care Act (ACA). Complying with labor laws requires that you are aware of them and that your people processes are in line with their legal requirements. You can refer to our article on federal labor laws for more information. In addition, many states have specific regulations such as overtime, sick pay, when final paychecks are due and what needs to be printed on a pay stub. Some cities add to these requirements with additional laws requiring commuter benefits (San Francisco) and paid family leave (New York), as examples. 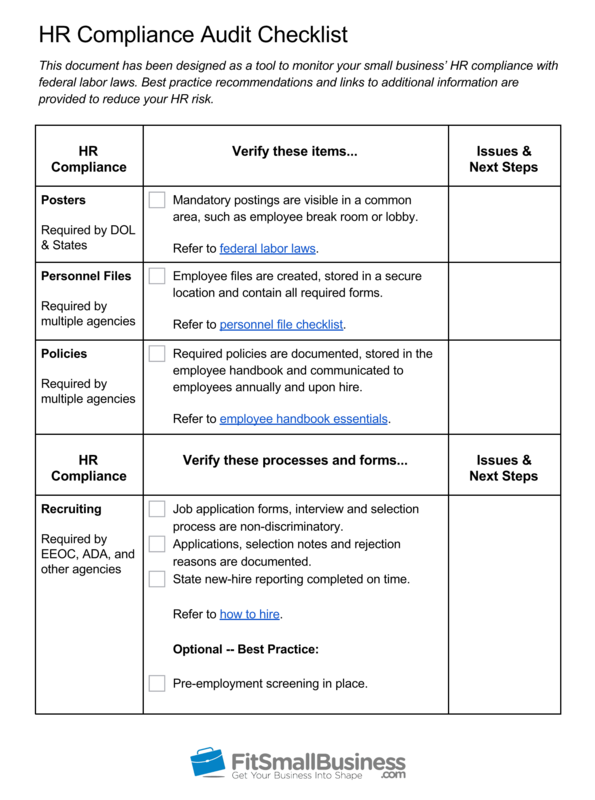 Here are the primary HR functions with examples of how HR compliance is achieved. Recruiting – Recruiting must be non-discriminatory from your job application form to your interviewing and selection practices (to meet EEOC requirements, as an example). In addition, to ensure pay equity, some states don’t allow your business to ask about prior salary. Onboarding – Once you hire someone, you need to obtain I-9 forms (per Homeland Security), as well as ensure you have the proper job classification (employee versus contractor, exempt versus non-exempt) per the Department of Labor (DOL). All employers must provide new hire reporting to the state. You also need to comply with state minimum wage, overtime, and mandatory posting laws, as well as rules such as when an employee may see their personnel file. Some states also add new hire training requirements, such as anti-discrimination training to be provided. 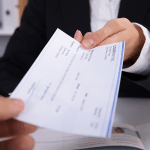 Payroll – Allowable payroll cycles vary by state, as do requirements for providing pay stubs, and whether alternative methods of payment, such as a pay card, can be used. The Equal Pay Act (EPA) requires pay equity. You also have to abide by timekeeping, payroll tax deduction rates and payroll document retention rules. These rules vary by state. Benefits – Once you reach 50 full-time equivalent (FTE) employees, you will need to abide by the ACA and FMLA—that means you have to offer health insurance and provide unpaid leave to eligible employees. If you offer a 401(k), there are additional requirements for document retention, for example. People Management – Labor laws cover sexual harassment, anti-discrimination (including when promoting or training employees), safety, discipline, and workers’ compensation. They provide guidance on what to include (and what not to include) in a personnel file, for example. Depending on your business size, industry and whether or not you have a physical worksite, you may also be required to send reports to the government, such as the OSHA 300 log or your benefits enrollment. Terminations – State laws often provide guidance on the at will employment doctrine, including what is required before you terminate an employee and when an employee’s final paycheck must be given. 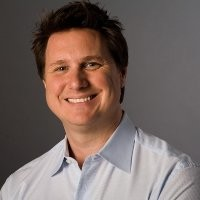 The four most common HR mistakes I see are: the misclassification of employees as independent consultants, not keeping accurate records of time worked and overtime, failure to set up and adhere to policies in an employee handbook (such as pay periods and pay dates), and lack of training on policies. When you fail to set these things up in writing, you end up defaulting to the state’s interpretation. And courts tend to side with uniformed employees, rather than employers. The larger your firm, the more likely your business is to be audited based on an employee complaint of discrimination, retaliation or unfair labor practices. In fact, ADP reported that nearly half of all EEOC charges filed were based on retaliation, which happens when an employee reports a workplace issue and the company punishes the employee for doing so by disciplining or terminating them. That’s why we recommend employers who are concerned about HR compliance consider working with a PEO (professional employer organization) like ADP Total Source. They provide compliance expertise and can assist in helping you with a legal defense if your business is slapped with an employment-related lawsuit. Employment practice liability insurance is also included. HR compliance is focused on how well your business adheres to labor laws and regulations. An HR audit focused on compliance can, therefore, help you uncover gaps in your HR compliance. It can also provide insights into the areas in which your business can improve its people processes. It’s best to complete an HR audit now, before you experience a lawsuit or labor violation. The first thing to consider when conducting an HR compliance audit is the scope. Then you’ll need to determine who will conduct the audit, what you’ll do with the findings and how you will address any follow-ups. Here are five steps to consider. Ask yourself, “What exactly are we auditing and why?” For example, are you auditing all of HR or simply auditing payroll and tax documents? Are you auditing adherence to labor laws, or looking for issues in non-discriminatory hiring? Is your audit triggered by an event (such as a sexual harassment complaint) or are you doing it as a preventative measure? You can use our HR audit checklist as a starting point to determine what to audit. Consider whether to do the audit internally or hire an external consultant or lawyer to do it. Refer to the HR Compliance Providers section in this article for ideas. You may need to provide your team with a bit of notice so they can prepare to provide you with documentation and answers. An HR audit for a small company may take no more than a few hours. A larger company may need to set aside a few days. You can use an audit form to document any findings. While a larger firm may compile HR audit results into a huge report, smaller companies can get by with sharing the findings in a meeting. However, the meeting should be limited in scope—perhaps only including the owner, top managers, and HR. It’s best to identify each issue, the risk it poses and potential ways to resolve the problem. That way, all are on the same page as you move to the next step. You’ll not only want to resolve issues, but you’ll want to prioritize those that are more important. Let’s say your audit found a safety issue (employees are bringing their kids to work on Saturday and letting them “work” with the equipment). Address that first—it’s an OSHA violation! Some issues are easy to resolve quickly, such as a missing labor law poster. Others may take more time, such as if you find a salary discrepancy where female managers are getting paid less than males in the same job. Or, perhaps your job interview form currently asks candidates if they’ve ever been accused of a crime. You may not only need to update your documentation but also retrain managers. That takes time. In any case, you’ll need to create a plan to resolve issues and get on it. All businesses can benefit from an HR audit to identify and uncover HR compliance issues. Here are a few scenarios when it makes sense and why. An HR compliance audit can help you set up your HR/people processes from day one, even before you hire your first employee. By using an HR audit tool, you’ll identify processes that need to be set up, such as state payroll tax payments and documents that need to be prepared, like an employee handbook and labor law posters. An HR audit can set your business up for success with best practice HR tools and processes, such as non-discriminatory job applications and sick leave policies. This is best done before you’re required to adhere to many labor laws that affect larger employers. An HR audit can ensure all your HR practices, documentation and files are in order prior to having to comply with labor laws, such as the ADA and FLSA that kick in when you reach that 50 FTE mark. Any business with 50 or more employees should be conducting an HR audit on an annual basis. This ensures you find HR compliance issues before being audited by an outside agency. You can then fix issues early to improve your chances of winning any potential lawsuit. In other words, an HR compliance audit is a good idea for any business that has employees. It costs little and can save your business money and headaches in the long run. The cost of HR compliance typically includes either labor costs (if you do it yourself), or the cost of hiring an external consultant or auditing firm to conduct the HR audit for you. That may cost hundreds of dollars an hour. Nonetheless, the cost of not managing HR compliance is likely to be much higher—if, for example, you’re sued by an employee for unfair labor practices or slapped with a labor law or payroll violation. $ Insurance Company – Some insurance companies will provide resources to assist you in auditing your HR practices. They do this to reduce their own risk from potential EEO claims to OSHA violations. Call your insurance agent to see if this is offered. It may be free. $ Do It Yourself – Depending on the size of your organization, this is usually a lower cost option. You may be able to complete the HR compliance audit above in hours or days; addressing issues as you find them. $$ Hire an HR Consultant – Hiring a consultant will cost a fee based on them doing an HR audit as a project or paying by the hour. In either case, you’ll likely get an unbiased view of any gaps in your HR compliance. The price depends on both the depth of your audit and how big your company is. $$$ Hire an Auditing Firm or Attorney – Hiring an attorney, based on their hourly rates, may be an expensive option. However, it has the benefit of attorney/client privilege. If they identify a major gaffe, such as files not being secure, you can fix the issue without the results of the audit being at risk for discovery (in case of a lawsuit). $$$$ Do Nothing – This is likely going to be your most expensive option. Here’s what SHRM says about the cost/benefit of an HR audit. The actual cost of an HR audit depends on the scope of the review, the number of people interviewed and the size of the audit team. Consequently, the expense varies greatly from one situation to another. Suffice it to say, though, that the cost of conducting any full-scale HR compliance audit will be far less than defending (let alone losing) even one lawsuit. HR compliance is not only a best practice for businesses wishing to attract and retain employees. From a strategic point of view, it’s also a business risk mitigation strategy. For example, fines may vary from a few hundred dollars (for failure to put up mandatory labor law posters), to thousands of dollars (e.g., violations in overtime and minimum wage). In fact, OSHA violations alone can run thousands of dollars a day, and some labor law fines can approach six figures, such as if you violate child labor laws and a minor is subsequently injured or killed on the job. Many HR and payroll providers include HR compliance features in their software and services. These may be reports that help you confirm pay equity, system checks to ensure your minimum wage rates are correct, or notifications about labor law changes and required job postings. They’ll also provide state-compliant overtime rules and print the correct information on employee pay stubs. Many also offer HR consulting for your HR compliance questions. Here are the different kind of providers who can support your HR compliance efforts. HR software is typically a cloud-based data tool that allows your business to keep track of employees by job and location. As such, it can identify relevant employment laws that affect your workers. It can flag issues, such as a missing I-9 work authorization form, or a worker who lives in a city that requires local employment taxes to be deducted from a paycheck. It also maintains employee documentation online, including employee policies and handbooks, employee review forms, job offers, and disciplinary letters. Some include recruitment tools such as legally compliant application forms and interview checklists to avoid HR compliance issues. For a low-cost HR software option that can support your HR compliance efforts, consider Zoho People. Zoho People is free if you have five or fewer employees. After that, it starts at only $1/month per employee and allows you to add on services like recruiting as your business grows. Many small business owners are surprised to find that their payroll provider, whether software or an outsourced payroll service, provides HR compliance. But in fact, most payroll services have HR compliance built into their employee payroll database. For example, they’ll be able to tell you what labor law posters are required, and in some cases provide them for you. They’ll also ensure that employee documentation, such as state and federal tax forms, are retained, and they will process payroll in compliance with state overtime rules. Most also offer workers’ compensation insurance and track time off for various kinds of leave, such as medical, maternity or sick leave. If you’re in a state that requires sick pay, they’ll know that. For a low-cost payroll provider that we find best for small business, consider Gusto. Gusto provides HR labor law compliance for as low as $6/month per employee plus a $39 monthly service fee. They also serve as an insurance provider, and can offer health benefits and 401(k) savings plans for your employees if you wish to add those. Many small employers who can’t afford full-time HR staff choose to work with a PEO instead. As a co-employer, a PEO works with you to ensure HR compliance. That reduces their labor risk and helps the business provide professional HR services similar to a larger employer. They typically offer consulting and legal advice as part of their package. And in some cases, working with a PEO can lower your worker’s compensation costs by pooling your workers with other companys’ employees. We recommend ADP Total Source as a full-service PEO that can provide HR, benefits, payroll, timekeeping, and labor law compliance in all U.S. states. Hiring a full-time HR manager is another way to achieve HR compliance. However, most small businesses can’t afford to do so until they reach a certain net income threshold. According to Indeed, a full-time HR manager costs an average of close to $55,000 per year. Therefore, many businesses wait until they have 50 to 100 employees or more before bringing a full-time HR manager on board. HR compliance focuses on those areas under the HR umbrella mentioned above, such as hiring, payroll, and benefits. It cross-references each function with the appropriate federal, state and local labor laws to ensure that the business is operating in such a way as to avoid fines and lawsuits. Traditional HR compliance focuses on regulatory requirements. However, there are other aspects of HR compliance that some businesses choose to monitor based on their specific organizational priorities. These HR compliance features and people-focused best practices can be added to an HR compliance audit. The HR audit form is simply a tool to confirm that your business is doing its best, and to identify opportunities for improvement. Consider looking at some of these HR aspects as you audit your HR function. Values – Does the leadership team support company values and best HR practices? Diversity – Do hiring and employment practices support diversity of people and thought? Compensation – Do pay practices support recruitment and retention of top talent? Communication – Does the organization provide adequate two-way communication? Employee Engagement – Are employees happy? Productive? Likely to refer candidates? Tools – Are processes streamlined so that employees are efficient? Onboarding and Training – Are new hires able to be successful and productive quickly? In this article from SHRM, author Eric Krell shares how some larger firms manage their auditing process, adding these other HR best practices. Regardless of whether your HR audit is focused solely on HR compliance or provides more broad insights, there are pros and cons. The benefits of HR compliance outweigh the costs. Here are some of the pros of taking the time or spending the money to do a periodic HR audit. Reduced Mistakes and Fines – Even an honest mistake, e.g., failing to pay your office employee overtime when they answer email from home, can require you to pay fines that are double the back-pay due. It’s best to identify and resolve issues beforehand. Improved Legal Outcomes – You can’t prevent a disgruntled employee from filing a lawsuit. But by adhering to HR best practices, you can improve your chances of winning. Happier Employees – Labor laws are designed to protect employees. When your company complies with workforce requirements, you’ll find your employees are happier and better able to focus on the job they’re hired to do. There are few downsides to doing an HR audit. However, here are some you may want to be aware of. Doing an Audit Yourself – The downside of self-auditing is that you may lack the HR insight to notice a compliance issue. In addition, if you have an HR staff member responsible for the audit, they may not want to self-report their own mistakes. Documentation of HR Issues – There’s rarely a problem if you document and then immediately fix gaps in your HR processes. However, the report itself may be discoverable in case of a lawsuit. Therefore, make sure that anything you identify is fixed immediately so that a complainant can’t later say that you knew of, and didn’t address, HR compliance issues. 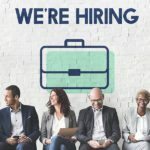 Hiring an Attorney – The downside of hiring an attorney to make sure your business is HR complaint is that it’s expensive. However, if you feel that serious HR violations may be discovered, it will be in your business’ best interest to have attorney/client privilege on your side as you work to address issues. HR compliance comes into play when you have employees. The best way to avoid HR compliance issues is to not to hire employees. That may be an option if you work with a temporary staffing agency or a contract employee and outsource your staffing altogether. Temp and staffing agencies are in the business of providing workers to your company. The workers are hired by the temp agency, not you. Instead, your business pays a fee for use of the worker. It typically costs 30 percent to 50 percent more than if you paid the worker an hourly wage or a salary. For example, if you wanted to hire a customer service rep that you might normally pay $10/hour, you may have to pay $13/hour to $15/hour to have that worker provided through a temp agency. However, the advantage to you is that you don’t have to recruit, interview, hire or pay the worker. You simply pay the invoice sent to you by the staffing firm. They, in turn, pay the worker and manage all the employee’s HR stuff. Contract workers may be self-employed, independent contractors or gig workers you find on a freelance website like Fiverr. These employees are paid via 1099, not W-2. However, the DOL provides very specific guidelines on what type of work falls under the category of employee versus contractor. While hiring a gig worker won’t eliminate your HR compliance issues, your HR workload—from processing payroll taxes to providing health benefits—is significantly reduced. Here are questions that small business owners may have about HR compliance. As a mom/pop business, do I have to worry about HR compliance? Many of the labor laws that require HR compliance don’t kick in until you’ve reached a certain threshold in terms of number of employees. For example, some states require you to provide sick leave once you have only one employee. Anti-discrimination practices generally become enforceable once you reach a staff of 15. At an employee base of 50, you need to be concerned about health insurance and family medical leave. And to add to the confusion, each state has its own specific requirements. That’s why we recommend working with an HR/payroll-compliant vendor, like Gusto, as soon as you hire even one employee. What is the risk of a do-it-yourself HR compliance audit? When you audit HR compliance yourself, you run the risk that the data you find may be “discoverable” in a court of law if you’re later sued for a labor law violation. Having a licensed attorney conduct the audit may give you attorney/client privilege and some measure of confidentiality. Are there other kinds of HR audits? Yes, as a business owner, you may want to monitor more than HR compliance when you audit your people processes. For example, you may want to audit employee satisfaction, your recruiting time frame, or how well HR is aligned with your overall business strategy. What do fines cost if our HR audit misses something important? Fines from the various regulatory agencies may range from a few hundred dollars a day to six figures. However, if the regulatory agency feels you’ve done your due diligence and attempted to fix issues, they may reduce the fines. That’s why we recommend doing an HR audit. It’s better to spend a few days correcting issues before they’re found and you’re on the hook for big fines. Being aware of what HR compliance entails, and monitoring your business to ensure it’s compliant, can save you money. It can also improve your employment brand. We recommend that you voluntarily audit your HR practices annually to ensure you’re not setting yourself up for unhappy employees, lawsuits or hefty fines. Working with a co-employer like ADP is a great way to ensure HR-compliant business practices. ADP Total Source is a PEO solution that also gives you access to legal support for everything from recruiting to labor and payroll laws.